Combine the mustard, oil, fennel seeds and rosemary, season. Rub the mixture into the rabbit, then dust with flour. Heat the oil in a frying pan. Brown the meat in batches for approx. 3 mins. per batch, remove from the pan. Add a dash of oil to the frying pan if necessary, sauté the shallots, garlic and leek for approx. 5 mins. Pour in the wine and reduce a little. Return the meat to the pan, bring to the boil. Cover and braise in the lower half of an oven preheated to 160°C for approx. 1 h. Remove the lid, pour in the cream, add the mustard, cook (uncovered) for approx. 15 mins. Heat the butter and sugar in a pan, add the carrots, sauté briefly. Pour in the water, season with salt, cover and simmer for approx. 5 mins., remove the lid and simmer for approx. 5 mins. until all the liquid has evaporated. Bring the stock to the boil, stir in the polenta, reduce the heat, simmer over a low heat for approx. 4 mins., stirring constantly to form a thick puree. 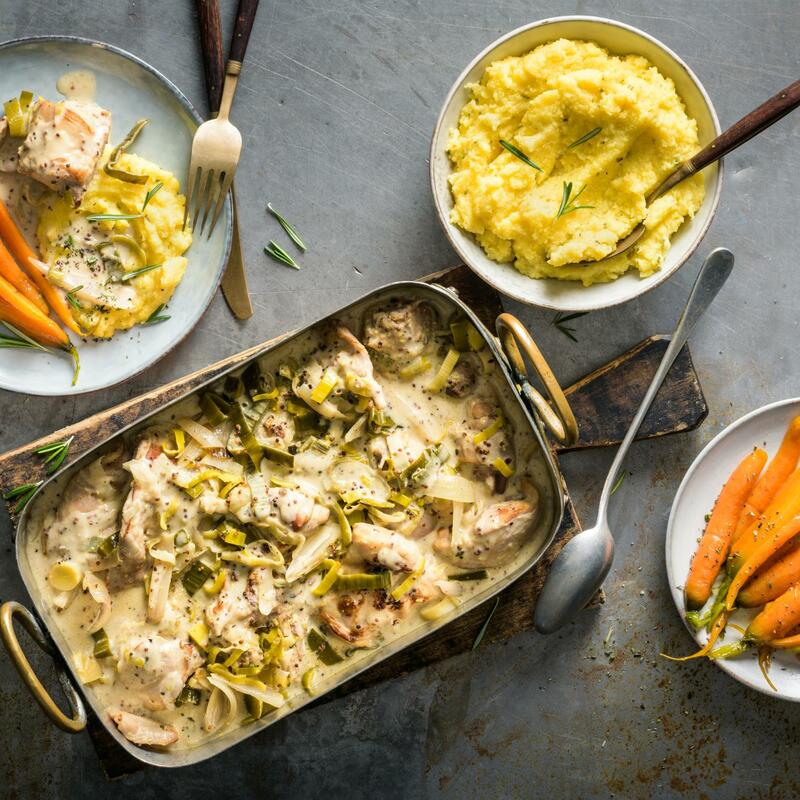 Stir in the cheese and rosemary, season, serve the polenta and carrots with the rabbit.